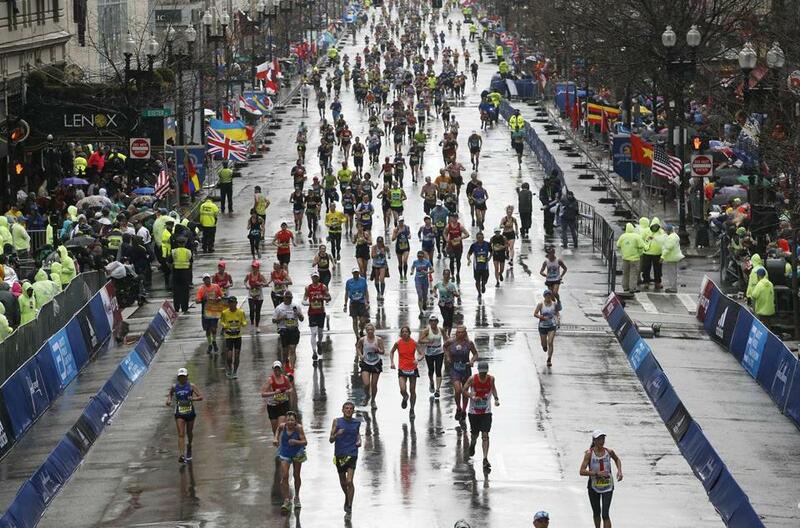 Boston Marathon runners endured heavy rain as they came down Boylston Street toward the finish line Monday afternoon. HOPKINTON — Sweat-soaked faces at the start of the Boston Marathon near Hopkinton Green were relieved by a refreshing morning shower of rain. Some runners danced around puddles, others plowed right through. For select Boston Marathon participants, however, traversing the course amid what some perceived to be dreary weather added to the thrill. After all, this is Boston, the world’s most iconic 26.2-mile race and course. Before the race, at the Athletes’ Village, the excitement was far from feigned. Dan Newman of England was running his first Boston Marathon as a representative of the Encephalitis Society. The 32-year-old embraced the challenge of a rainy route, which he finished in 3:05:50. 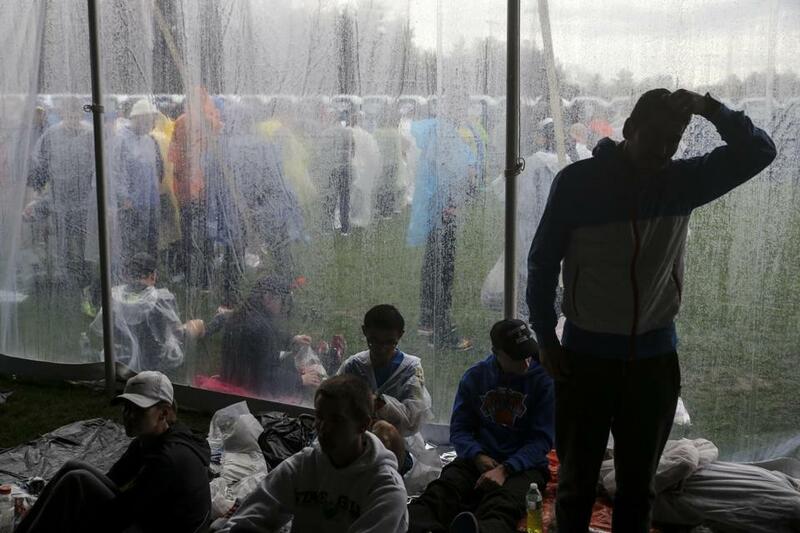 Runners took to one of the tents in the Athlete's Village to escape the rain before the start of the race. Participants in the 123rd edition of the race received a wet greeting similar to last year’s treacherous conditions, with early morning thunderstorms brewing from the starting point on East Main Street. Roughly two hours before the scheduled start for the wheelchair events, Wave 1 runners took shelter at Hopkinton’s Middle and High Schools, while runners in Waves 2, 3, and 4 waited in buses near the Boston Common to avoid downpours. For runners, a battle with elements is the luck, or lack thereof, of the draw. Last year’s race featured temperatures in the 40s coupled with a deluge. It was about 15 degrees warmer at the start of this year’s race, but the Athletes’ Village was deluged. Just before 9 a.m., however, the rain subsided and gave way to a soft drizzle. Anticipating inclement weather, Boston Athletic Association officials moved up the originally scheduled start time for Wave 4 in order to reduce waiting times. The BAA also added tent walls and additional heat to staging areas and additional medical stations along the route to combat the dreary weather conditions. The runners, nevertheless, embraced the rain and were thankful for a helping tailwind at the start of the race that protected their faces from being pelted by rain. Runners make their way through the rain in the Athletes' Village before the Boston Marathon. “The fact that the weather is cooler here, it makes all the difference,” said Dave Masterson, 54, of Palm Beach Gardens, Fla., who completed his fourth Boston Marathon in 3:06:24. While cloud cover overcame the sun just after the start of the elite women’s race and ahead of the launch of the men’s elite field, overcast and cooler conditions prevailed for the departure of Waves 3 and 4. It did little, however, to diminish the palpable anticipation that permeated the start of the the eastward jaunt from Hopkinton Green to Boylston Street in Boston.